Please note that the ORFC 2019 recordings were made by volunteers, using non-professional equipment. The audio and slides can be found here: ORFC 2019 audio archive. sunlight into nutritious, creamy, carbon-neutral, ethical milk, using regenerative agriculture. Smiling Tree Farm is an organic, 100% grass-fed, cow-calf dairy where the calves stay with their mothers. The farm’s milk and meat is certified 100% Pasture for Life by the Pasture Fed Livestock Association, a certification label for consumers who want 100% grain-free animal products. The herd of only 10 Jerseys graze on tall perennial, diverse pastures. There is a movement of consumers who are moving away from milk, and seek alternatives. Christine suggests that those people who reconsider milk, look for an alternative to industrial dairy, and real milk. In countries which allow the production of raw drinking milk, many consumers have already identified these dairies. Christine contends that real milk can only come from regenerative farms, where cows are raised compassionately, the land is cared for, and a nutritious product is produced. She says we need to care about three things: animal compassion, environmental care and nutritious food. At Smiling Tree Farm, they provide a high-welfare home for contented ruminants who convert grass unsuitable for growing crops, to nutritious food for humans. They help reverse climate change through holistically planned grazing on the grassland, which stimulates rapid photosynthesis, sequesters carbon and grows deep fungal-dominated soils alive with micro-organisms. water. This is a comparison of water that has been metabolised through the body of a cow, versus water added to a processed crop, without considering the value of the nutrients. Christine says that without considering what nutrients are in each serving, this comparison is “pretty meaningless”. 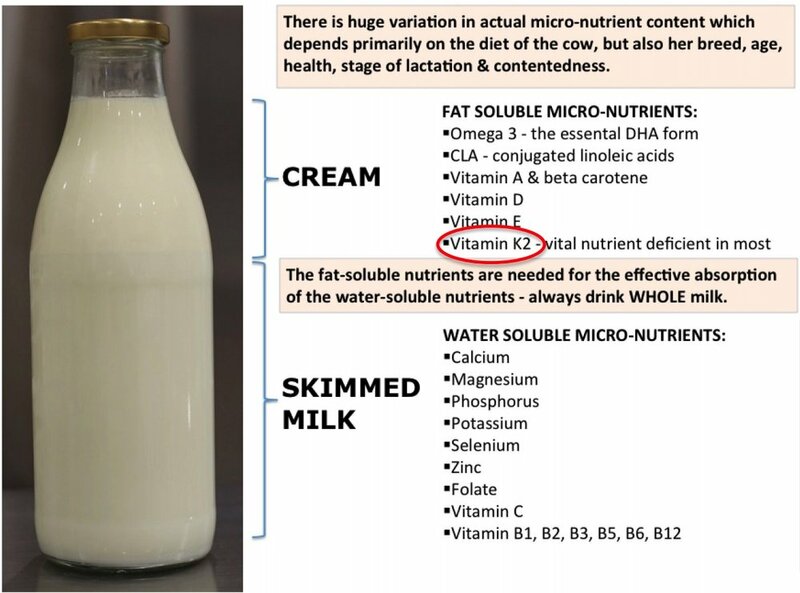 In slide four, she presents a graph by Dr. Jude Capper that is more useful comparison; that of milk as a nutrient-dense food. Christine explains that cows are up-cyclers. They eat grass, which humans cannot digest, and through the magic of microbial fermentation, they up-cycle the grass to a highly nutrient-dense food. The image below shows a bottle of milk from one of the farm’s old-fashioned A2 Jersey cows. The cream is the part where most of the desirable, healthy, fat soluble micro-nutrients are. Christine says that real milk is whole, unprocessed, unhomogenised, preferably raw from healthy, 100% grass-fed, organic cows raised with compassion. This is a discovery that more people are making around the world. The raw milk revolution has already occurred a decade ago in the USA, and a UK report shows that “the proportion of the population currently consuming RDM has increased from 3% of the population in 2012, to 10% of the population in 2018”. Image: this is a partial snapshot of slide 7 of Christine’s presentation. Click to enlarge. In slide 9 of her presentation, Christine describes how all of life depends upon photosynthesis. The following is the “liquid carbon pathway” as described by Australian soil scientist Dr Christine Jones. As the cows eat, every bite primes the carbon pump. ”It’s not the cow, it’s in the how.” Regenerative agriculture can sequester carbon and combat CO2. It’s good for the planet and good for producing nutrients in food. In her presentation, Christine mentions this article, that explains that grasses have evolved to be grazed. When combined with appropriate grazing (like mob grazing or an intense rotational grazing system) that mimic ancestral herd movements, grasslands are the key to carbon sequestration on a rapid scale. Unlike bushes and trees that store the majority of their biomass above ground and do not respond to repeated browsing with rapid re-growth, evolution has bestowed grasslands with the unique ability to not only withstand repeated grazing but to positively benefit from it. Grasses also benefit from disturbance and fertilisation by ruminants, as well as their role in preventing the plains and prairies progressing into forest. Each bite primes the carbon pump, because when grass are grazed, plants release more exudates, which feeds and grows massive amounts of soil microbes, which participate in both the nutrient- and the carbon cycle. In pre-industrial times there were vast herds of herbivores that roamed grasslands, but they were not causing any climatic crises. Grasslands are the world’s largest and most perfect carbon sink. carbon without increasing atmospheric methane. The first speaker, Dr Michelle Cain, speaks about methane, and there is a lively Q&A about methane, and mitigation strategies directly after Christine’s presentation as well. It is hard to pin-point research into methane, because there is not one singular cause of its release into the atmosphere. Michelle also explains why going vegan is not a solution for reducing climate change emissions. Grass-fed cows produce less methane. In recent years, livestock farming has been vilified for its role in climate change. People are recognising that growing grain crops for intensively-farmed livestock production, can have a huge impact on releasing carbon into the atmosphere, and other environmental issues. Grass-fed ruminants are not the problem. When consumers learn how important it is to keep cows on pasture, as opposed to a grain-based diet, they come to appreciate the real nutritional value of pasture-based animal products, and their viable contribution to the environment. Grazing ruminants in tall, regenerating grassland mitigates climate change, support biodiversity, return pristine natural environments and create nutrient-dense food for both animals and humans. Grass-fed animal products are higher in a healthy ratio of omega-3 fatty acids and CLA, learn about the science here. Enabling unpasteurised dairy production also makes it more viable for farmers to switch over to a more calf and cow compassionate dairy setup, for those consumers who want to participate in a high-animal welfare food system. Allow people to make these choices and the problems in the dairy industry will sort itself out. ORFC19 CHR 2.4 The rise of milk substitutes: how can dairy producers respond? is that when you burn #fossilcarbon you put it in the atmosphere for 1,000yrs, but a cow burping methane has a 10yr warming effect.